He isn’t getting the words right. fish bones and cool stones. of dictionaries and doesn’t know where to start. He’d give his right leg to get his mind back. how to hold their chisels. The window designers can only imagine plain glass. In an explanatory note (all the poems and prose include such entries, sometimes unnecessarily), Daldorph mentions that the poem is about a fellow writer and friend who was still at a relatively mild stage of the disease. For this book as a whole, however, the focus is almost entirely on people with severe dementia. And while most of these poems are well-crafted, the cumulative impact can be deadening. An endnote helpfully points out that the poet is also an insurance adjuster. that flare then vanish in the plume? from yard to yard to be taken inside? clumped inside cells I cannot see. A word her mouth is forming. next to some loose change. we took her keys away. Two poems were inspired by Homer’s Odyssey. or Circe, deaf to her corrections. of shades now a fading sallow shadow. Ithaca, back to her, back to himself. Another favorite of mine is “Pacific Sunset,” by Arthur Ginsberg. The poem is a kind of love song for the poet’s mother, an immigrant whose profound dementia causes her to mistake a beach on the largely wild ocean side of Vancouver Island for the city of Montreal. The poem suggests a deeply reciprocal relationship played out between mother and son. With good cheer, Ginsberg describes the old woman berating him for things he is not responsible. an empty bowl in the dark. Are there weaknesses in this collection? My main objection is that the vast majority of poems and essays focus on people at or near the terminal stage: the stereotypical face of the disease. And in conceiving the book, the editors never seem to have realized that there must be many poets and writers with Alzheimer’s. I’m one of them. But that is not how Alzheimer’s works, particularly with those of us who have the early-onset version. To be diagnosed early can be a blessing, allowing people to make the most of the years that remain. Yet the poems and essays in the book are overwhelmingly about people in the disease’s dreaded late stages. At times I found the effect deadening: It forced me to dwell on what likely awaits me. For all the strong writing in Beyond Forgetting, the anthology’s narrow focus has the consequence of making Alzheimer’s seem an even more ghastly illness than it actually is. Beyond Forgetting can be purchased from Kent State University Press: www.beyondforgettingbook.com. Yet, studies suggest that African-Americans and Hispanics are at a greater risk of developing Alzheimer’s than the U.S. population at large. According to the 2011-2012 Alzheimer’s Disease Progress Report, a sample group of Hispanics (mostly Puerto Rican immigrants) were more likely to show symptoms of the disease and experience more severe symptoms at their first evaluation. The results of a large study at Rush University in Chicago indicated that older African-Americans with low levels of education had not just poorer cognitive function but also more limited cognitive abilities compared to whites with the same level of education. Seniors often congregate on their own at a centrally located McDonald’s. But the lack of suitable meeting space in Roxbury didn’t prevent Kincade, back in 2001, from organizing the first African-American Community Forum on Memory Loss. Over the next five years, it became the largest annual gathering of African-American caregivers in the nation, attracting more than 200 attendees annually to a site in the city’s Dorchester section. “When they showed up, it was a shock and surprise to many people,” Kincade said. Among the panelists were a neurologist, an estate-planning attorney, State Rep. Gloria Fox, and an admissions director of a nursing home. The model, Kincade noted, has been replicated in many other U.S. cities. Until a few months ago, I was not aware that seizures were a relatively common aspect of Alzheimer’s—about 10 to 20 percent with the disease experience them, according to Dr. Keith Vossel, a neurologist at the University of California at San Francisco. I linked up with Dr. Vossel at the suggestion of my high school classmate and football teammate Steve DeWitt, who some years back suffered a seizure that appeared to be Alzheimer’s-related. Vossel is one of Steve’s doctors. How the drug works remains somewhat of a mystery. “We’re basically finding that really low doses of this medication may actual be helpful with cognition,” Vossel said. “But particularly in Alzheimer’s disease models, it seems to have some specific action that clamps down on excess brain activity caused by the amyloid-beta protein”—not in the plaque form but the soluble form. Vossel and his fellow researchers believe that memory loss, at least in part, is a consequence of amyloid peptides disrupting the brain’s network activity. “Essentially, what it can do is lead to excess activity in the brain, manifesting as seizures. “We’ve been able to dissect out part of the cause of the seizures, and also how to suppress the seizures, in a number of different ways,” Vossel said. “And by doing that, we’ve found that seizures are very tightly linked to the cognitive deficits and even the synaptic changes, the connections between the neurons. It seems to be very related to amyloid peptide changes” — a key component of plaque that builds up in the brains of those with Alzheimer’s. In research involving mice, the seizures “can also be quite subtle ….Essentially, the brain is raising its defenses against these seizures, and by doing so, the brain is less able to attend to normal functions such as learning and memory. We think that the drugs need to suppress the seizures for several weeks for the brain to recover and regain normal function. “Surprisingly, to us, we can make genetic modifications in the brain like lowering tau,” the component of tangles that form in the brain. “By doing this, we can also prevent seizures,” Vossel said. My thanks to Steve DeWitt for suggesting that I interview Dr. Vossel. I learned a lot. · “Why Are Americans Scared to Talk About Dying?,” published on the website of National Journal on Feb. 1. But Americans’ willingness to speak frankly about their mortality has been on the rise for many decades, beginning with Elisabeth Kübler-Ross’s landmark book On Death and Dying in 1969. And one recent manifestation of this trend is the rise of Death Cafes, venues for talking about the fine points of death and dying, typically accompanied with caffeinated beverages and sweets. I heard the term for the first time a couple of weeks ago, when Paula brought home from the Somerville Library a bright-blue flyer with the words Death Cafe prominently displayed in a jaunty font. It took me a fraction of a second to confirm that it did not refer to “Death Cab,” the shortened name of one of my favorite bands. But the script served its purpose. This would not be a somber experience. Paula and I were curious. The first thing that struck me—other than that it was well attended, with seventeen people spread among two groups—was that there were several young people on hand. One of them mentioned that he recently lost a friend to opiate abuse. A pair of youthful sisters spoke articulately, and sometimes quibbled, about elder care and end-of-life policies. One expressed a desire to someday own a beautiful necklace with a decoration for holding her parents’ ashes. 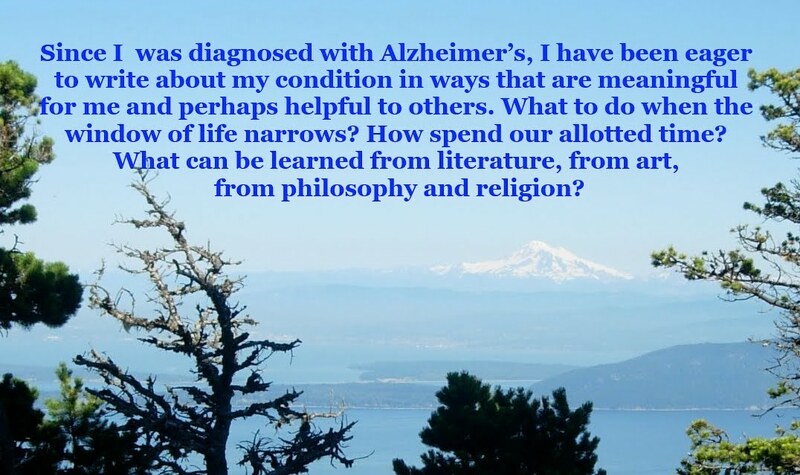 Paula noted that she’d always assumed that I would outlive her, an expectation that was turned upside down by my diagnosis of Alzheimer’s. She also mentioned the loss of a beloved grandmother who died suddenly when she was a teenager. A woman with a terminal condition spoke matter-of-factly about the terms of her dying. Others spoke about the extent to which family members should be bound to the deceased’s wishes. If a person planned to be cremated, what would become of the ashes? Keep the urn in a closet? Display it prominently? Bury the urn and ashes in a family cemetery plot? Scatter the ashes in the wind, over a favorite lake or bay? Would doing so go against health and environmental regulations? One topic concerned social media. Should survivors of the deceased shut down the person’s Facebook site, making clear that a presence on Facebook did not connote immortality? Or transform it into a virtual shrine, with comments and “likes” helping to show that the person has not been forgotten? Not surprisingly, most venues dedicated to Death Cafes are in affluent nations, North America and Western Europe in particular. All six habitable continents are home to the phenomenon, although southeastern Europe and Russia, perhaps having more pressing matters to worry about, appear to be largely indifferent to the concept. And the only Death Cafe in the Middle East or North Africa is in Jerusalem. The session that Paula and I attended took place at the Somerville Central Library and was facilitated by Glenn Ferdman, the library director, and Janine Lotti, who is the city’s Council on Aging’s senior project manager. Ferdman, who became acquainted with the Death Cafe concept while working in the Kansas City area, handed out a “Death and Dying” bibliography that includes titles such as Being Mortal: Medicine and What Matters in the End, by Atul Gawande; Things I’ve Learned From Dying: A Book About Life, by David R. Dow; and The Last Lecture, by Randy Pausch, written by the celebrated computer scientist who died in 2008 from pancreatic cancer at age forty-seven.